A new study published in the journal Proceedings of the Royal Society B: Biological Sciences reveals one of the enigmas related to the social behaviour of the western lowland gorilla (Gorilla gorilla gorilla) in the heart of the African equatorial rainforest. These primates show a dynamic social structure -individuals change frequently between families- with a high degree of tolerance and peaceful coexistence among the members, according to the new article which counts on the participation of the experts José Domingo Rodríguez Teijeiro, Magdalena Bermejo, Guillem Molina-Vacas, from the Faculty of Biology and the Biodiversity Research Institute of the University of Barcelona (IRBio). According to the authors, this social behaviour may have played an important role in the evolutionary story of the species, easing the exchange of information and a better exploitation of trophic resources. However, this social dynamics may have worsened the impact of some infectious diseases in the population of gorillas, experts warn. In this context, epidemic Ebola virus outbreaks, which affected the primate population in Congo between 2002 and 2004, caused the disappearance of 95 % of this ape, causing this species to be in critical danger of extinction according to the Red List of threatened species by the International Union for the Conservation of Nature (IUCN). 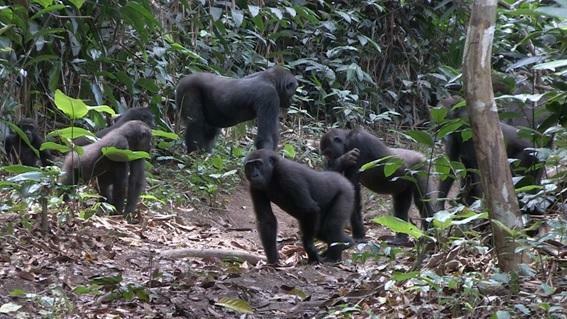 In the new study, carried out in the Ngaga Forest in the Republic of the Congo, counts on the participation of German Illera (Great Apes Conservation/Research Odzala-Lossi and SPAC gGmbH, Republic of the Congo), Giovanni Forcina, Rubén Bernardo-Madrid, Eloy Revilla and Carles Vilà (Doñana Biological Station EBD-CSIC) and other experts of the University of Rennes (France). The ecology and behaviour of the western lowland gorilla inside the equatorial forests was an enigma so far. Since the first scientific studies started, differences between the behaviour of these two African primates were known: the western lowland gorilla (Gorilla gorilla gorilla) -living in rainforests around the basin of the River Congo- and the mountain gorilla (Gorilla gorilla beringei), a better studied primate in the volcanic mountainsides of the African Rift. At the moment, hunting and epidemics endanger the survival of wild populations of these primates which share more than 98% of genetic material with the human species. Unlike the mountain gorilla, which has aggressive and infrequent interactions between families, the western lowland gorilla was known to have frequent and peaceful interaction between members of the families. However, due a low visibility inside the forests, western lowland gorillas that had been studied in bais, typical open clearings which are the meeting point for families of the species to feed from plants rich in mineral salts. As part of the study, the experts conducted a scientific monitoring over five years to three families of the western lowland gorilla in the same heart of the Congo forest. According to the conclusions, interaction between individuals from different families is common and peaceful so the individuals eat and play together with no signs of aggression. Regarding methodology, experts profiled an image of the social structure and parentage relations of more than 120 gorillas through the genetic analysis of faeces samples taken over four months -in families and single individuals- in the Ngaga forest. Data show families have a dynamic social structure in which individuals conduct frequent changes among family groups. Young individuals are usually outside the family and enter temporarily other family groups in which they have no close relatives. This social behaviour could be linked to the lack of infanticide records in this species, experts note. This new study shows the image of a modular society featured by the existence of strong ties which do not avoid the transfer of individuals between different families and a high degree of tolerance between their members. The results of this study show the importance of complementing in situ monitoring studies with non-invasive genetic analysis to find the structure and social dynamics in animal species which are hard to have access to. At the same time, conclusions highlight the importance of social behaviour in disease transmission and the development of effective conservation strategies in the long run.